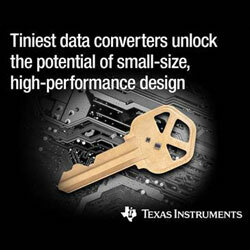 Texas Instruments has introduced four tiny precision data converters, each the industry’s smallest in its class. The new data converters enable designers to add more intelligence and functionality while shrinking system board space. The DAC80508 and DAC70508 are eight-channel precision DACs that provide true 16 and 14-bit resolution, respectively. The ADS122C04 and ADS122U04 are 24-bit precision ADCs that feature a two-wire, I2C-compatible interface and a two-wire, UART-compatible interface, respectively. These new devices join a portfolio of precision ADCs and DACs optimised for a variety of small-size, high-performance or cost-sensitive industrial, communications and personal electronics applications. Examples include field transmitters, battery-powered systems, optical modules, building automation and wearables.